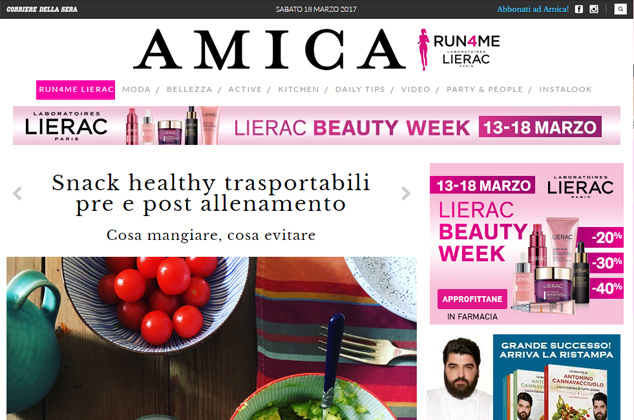 Thrilled to read about my detox retreats at D – la Repubblica. Yoga teacher Louise and I with our Glow retreats (@glow_retreats) will be soon in beautiful Maremma, Tuscany. 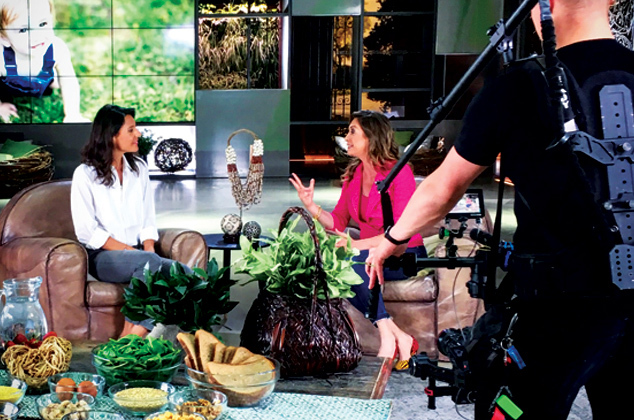 Thank to Tessa Gelisio for having me again on her blog, this time talking about some of healthy food and wellness fallancies. I had a nice chat with Alvin e Katia Follesa on their radio show on R101 where I suggested some tips for a health grocery shopping. 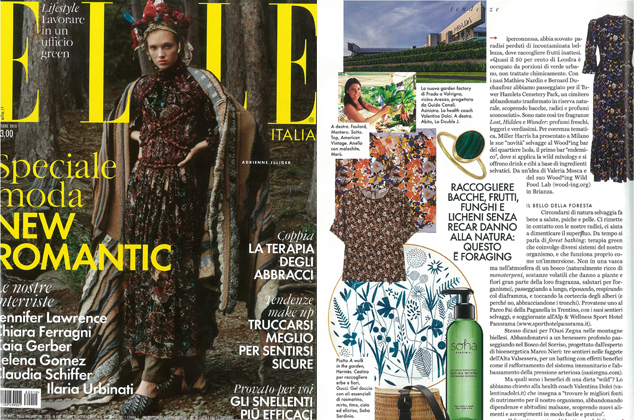 A brief story about foraging on the october issue of Elle and how to learn to recognize which herbs are better for a healthier way of life. 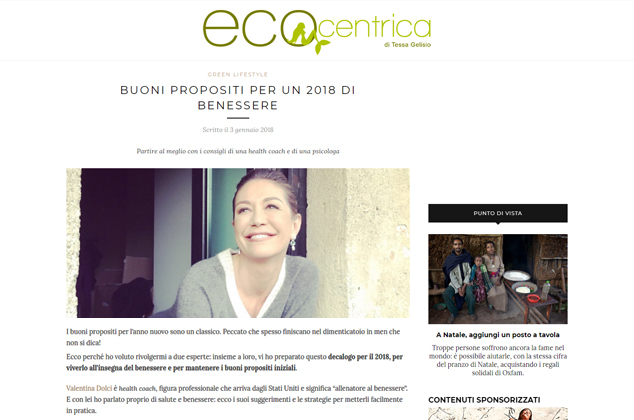 The first of the two stories on Ecocentrica, the Tessa Gelisio‘s blog, which hosted me to offer some hints on wellness good resolutions to follow in 2018. 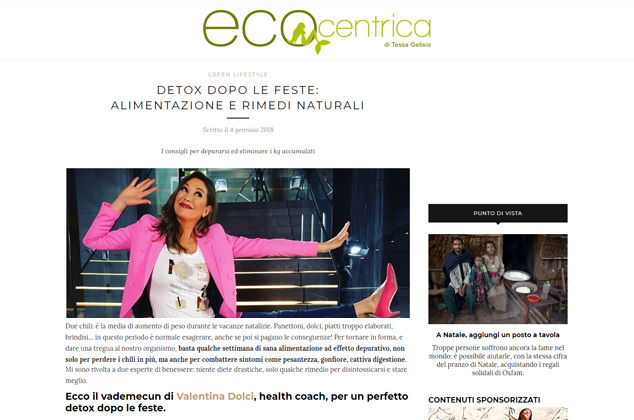 My second story as guest of Tessa Gelisio on her blog Ecocentrica, in which I recommend some simple and natural remedies to detoxify after the holidays. DietSpotlight.com is a wellness American website, has over 10,500 well researched, all-original reviews of weight loss products, diets and fitness equipment. 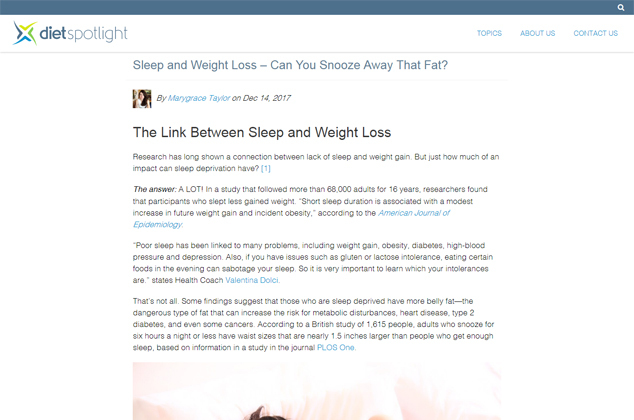 Thank you to the American DietSpotlight website for hosting me with my input about intolerances and sleep. 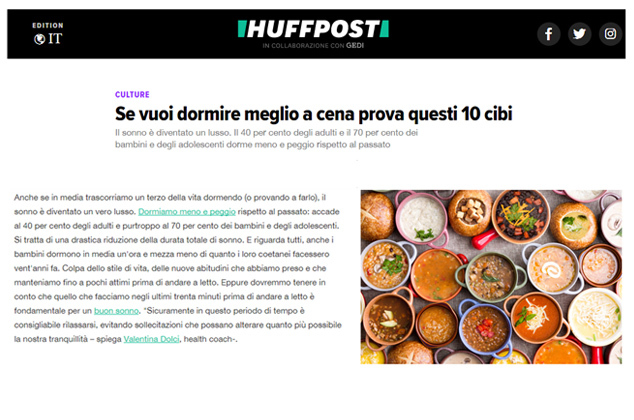 On the Post again, with some tips about the ten foods to choose for dinner to increase the quality of sleep. 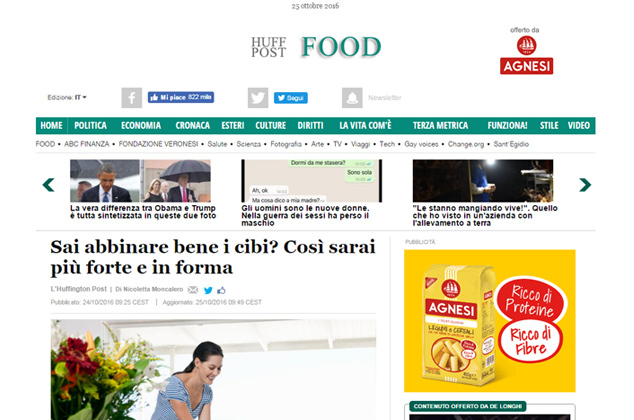 Below you can find the link to the clip of my second appearance at In forma con Starbene, hosted by Tessa Gelisio, where I say something about new tendences in sport and nutrition. 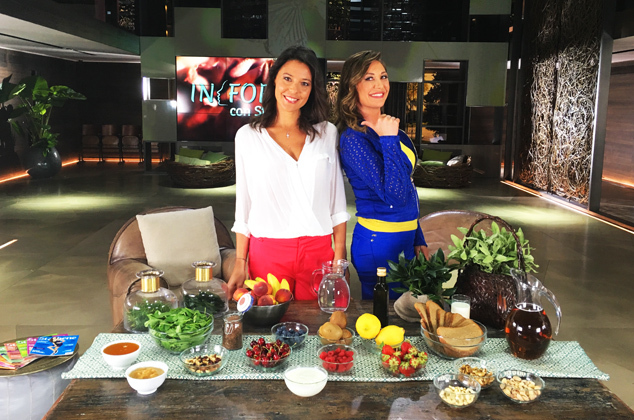 Below you can find the link to the clip of my appearance at In forma con Starbene, the Canale5 morning show hosted by Tessa Gelisio, with my tips to start the day in the right way. 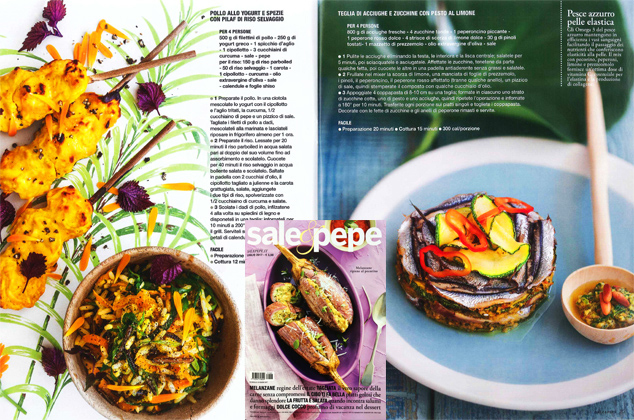 Editing and tips on recipes ingredients in the piece Il cibo ti fa bella, released on July 2017 issue of Sale&Pepe magazine. Do you know how to match foods? I’m back on the Post, this time to talk about the right combinations to compose a healthy and nutritious menu. 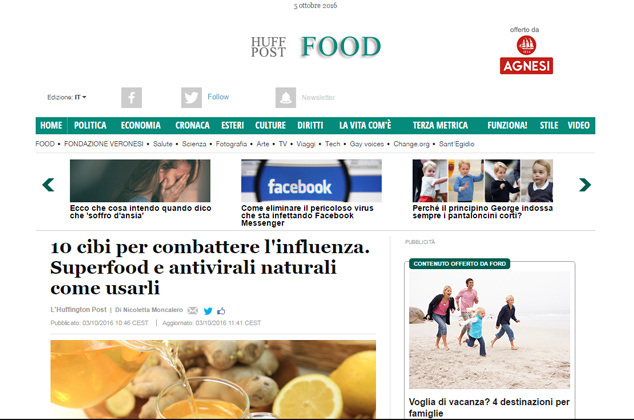 My tips about the ten best foods to fight back flu at the beginning of fall season. 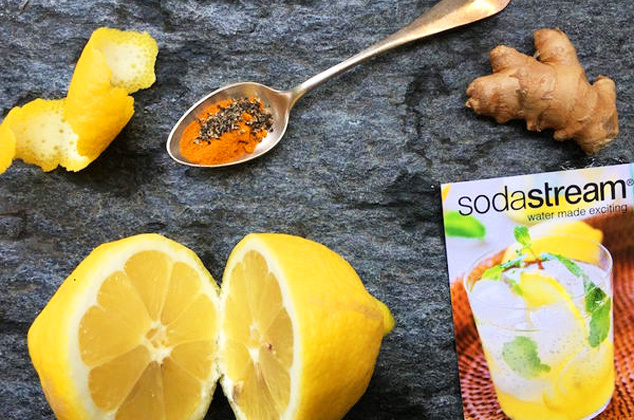 My recipe of elder detox water: antioxidant, it spurs metabolism and is an excellent remedy for hunger pangs. 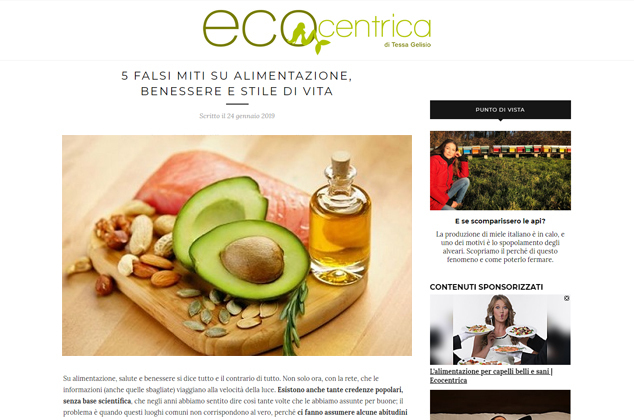 Four tips for healthy eating that the Health Coach gave to us is the title of Vanity Fair web piece about our new Sweet Elephant project. I am deeply thankful to Vittoria Filippi Gabardi for having very well expressed in words my growing path and the meaning of my work. Thanks to Cristiana Lopez for the shooting and the time she spent with me. 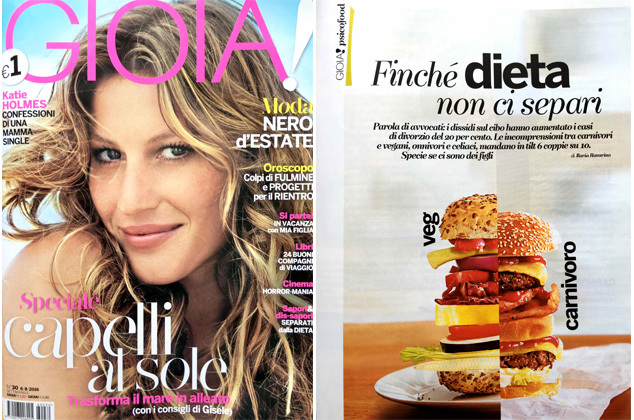 From my partnership with Stand Out Comunicazione, here the interview on the new Gioia issue. 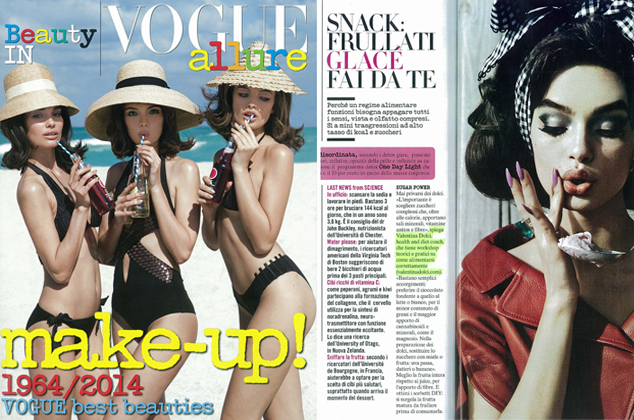 My second time on Vogue…Beauty: giving out tips on the healthier and guilt-free ways to satisfy your sweet tooth! 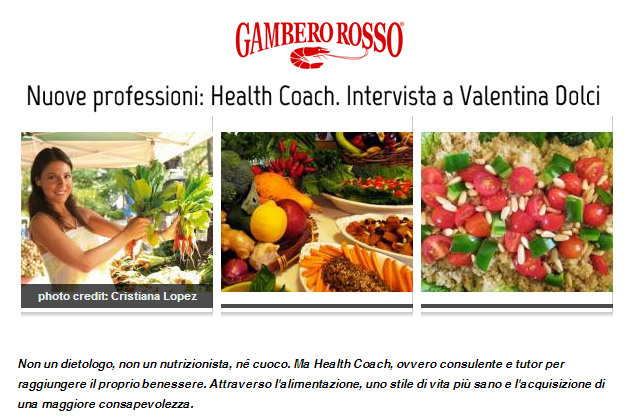 I am honored to be published on the leader for Italian food and wine industry, Gambero Rosso, focusing on Health Coaching as imported new profession from the US, raising awareness on wellbeing and supporting a heath transformational process. 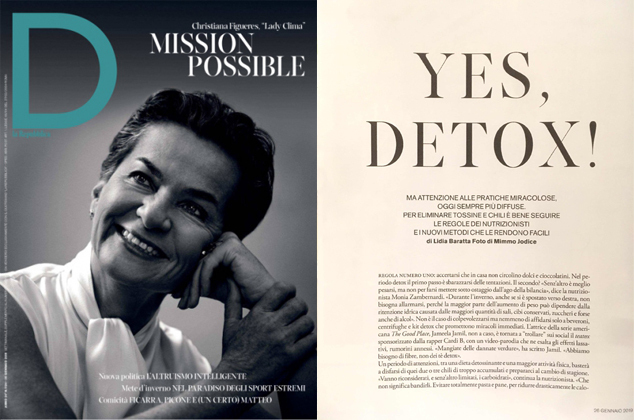 Such a great opportunity to be on the first issue of the new Italian wellness magazine Dimensione Benessere! 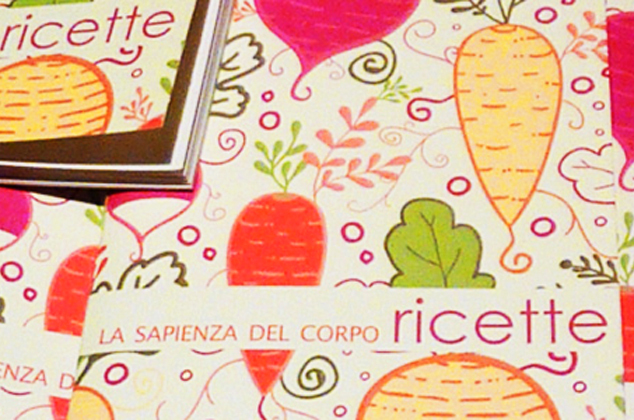 Now available my first recipes collection. 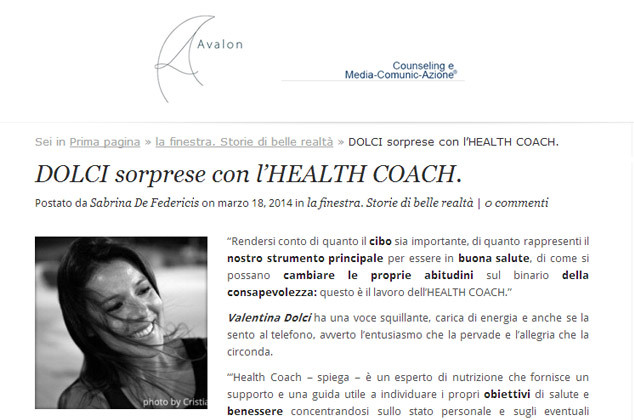 For any information on how to order the book, you can write to valentina@valentinadolci.com. Such a great pleasure being interviewed by a Counseling website focusing on my personal, professional growth and my life changing experience. 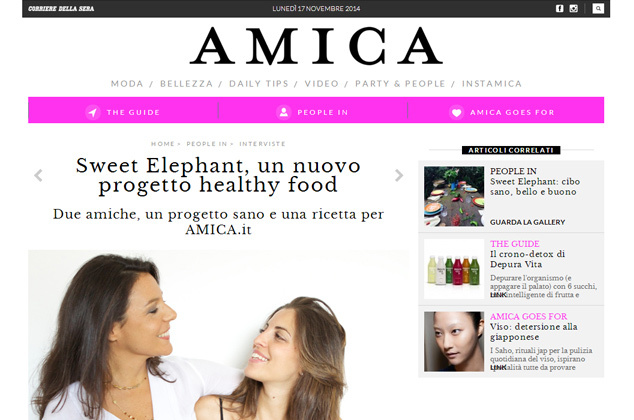 First official piece about Sweet Elephant, the new healty project produced with Marika Elefante.